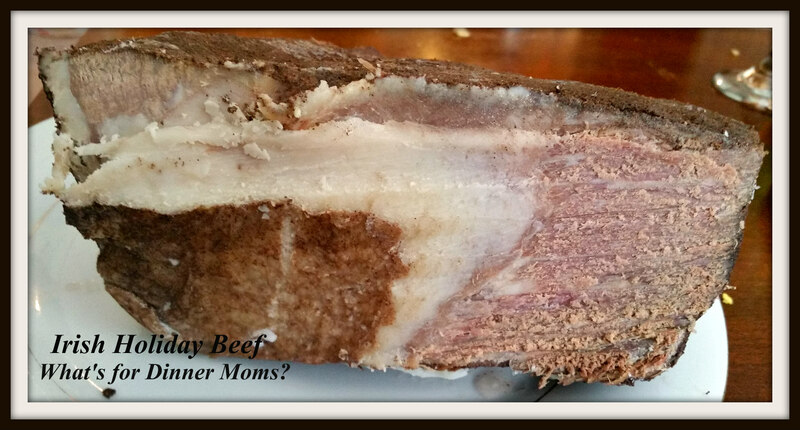 Holiday Spiced Beef (12 days in the Making) – What's for Dinner Moms? I make German food and German inspired food quite often. The joke in our house is that my daughter began eating sauerkraut from a jar with a fork by the time she was four. She cannot believe there was ever a time she did not love sauerkraut. But, we don’t talk about cooking much Irish food. My daughter is an Irish dancer and my other half has a family that is completely steeped in their Irish ancestry. One of my gifts to myself this past year was a cookbook from Ireland. My family loves trying new foods and other than corned beef (which is not really Irish), boiled potatoes, and stew I have never really made true Irish food. We have been itching to try one of the recipes from the cookbook. We had a roast and decided to try to make the Holiday Spiced Beef. This is NOT a recipe you can just decide to make one day. It has several steps over 10 days and then you boil it. After boiling the roast you let it rest for 2 more days before it is ready to eat. It is thinly sliced and served cold. There are many variations on this dish and this is just the one we make. It is really easy to make just takes quite awhile before it is ready to eat. The original recipe is from Real Irish Food by David Bowers. I have changed the recipe a bit from its original. After reading many different recipes I took the best of what my family liked and made it for us. I hope you will do this same. 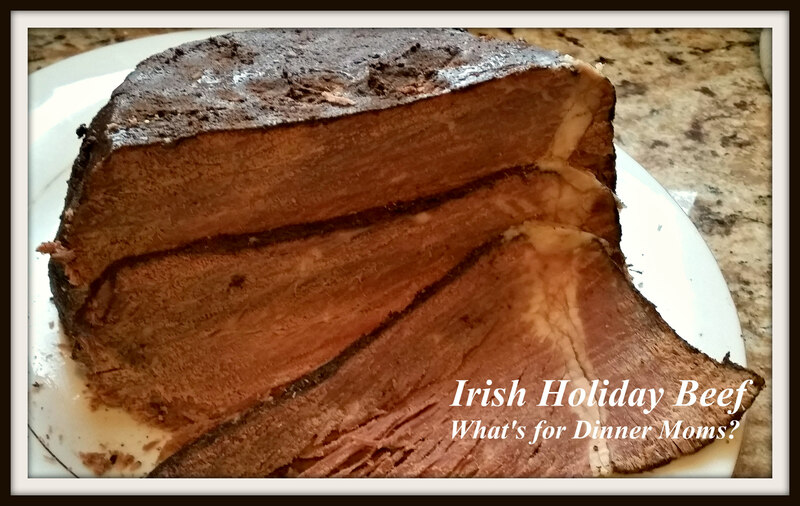 This dish from Ireland, particularly County Cork, is a traditional Christmas or New Year’s Day dish. We served it on New Year’s Day. It smelled amazing when we were cooking it and the kids kept looking at it longingly each day it was in the refrigerator wondering when they would get to try it. We loved this. It had a strong flavor of allspice which permeated the meat. I am not sure it was the flavor of the meat as much as this was like a little family project that made it so good to us. You can make it into sandwiches, serve it with sides, or as we did slice it and eat it throughout the day. Tip: The original recipe calls for saltpeter which you can order a food grade version in the United States. If you don’t want to order you can use celery powder or celery salt. You don’t really need it. It is more for the coloring of the meat than anything else. It may be grayish in color without saltpeter or celery salt rather than pinkish. Day 1 – rub the roast with brown sugar and place in a glass or ceramic dish. Cover tightly with plastic wrap and refrigerate. Day 2 – Combine all spice and saltpeter and rub the entire roast with it. Recover and refrigerate. Day 3 – Rub the roast entirely with the coarse salt and then recover and refrigerate for 7 days. Day 10 – In a large stock pot pour the beer into the pot, add the roast and then add enough water to cover the beef. Simmer at a low boil for 2 hours. Remove the beef from the stock pot and place it in a glass dish. Cover the beef loosely with plastic wrap then lay a plate over the roast. Weigh down the plate by placing several heavy cans or a clean brick on top of the dish. Refrigerate for 48 hours before slicing. Thank you! It was kind of a fun little family project and it did taste good with all the allspice! So, that is a really cool recipe, Marci! Thank you, Erika! It was a fun family project. I like good German food. This 10 day process is long but I’m sure it’s good. It was a long process but it was fun for us at the same time. That is exciting to try new foods! What a recipe!! It was a fun project for us!